She has a bachelor degree in General Arts and Education from India. She is a teacher by profession. She has taught geography for many years. Her teaching experience would be an added advantage for tourists to know more about our country. She also possesses a good communication skill. 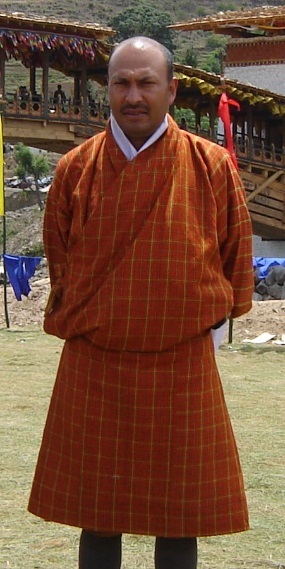 He has a bachelor degree in BA economics (Honours) from Sherubtse College in Kanglung,Bhutan. He also has a master degree in Economics from ICFAI University in India. He was a teacher by profession. He has taught Economics and Business Mathematics in higher secondary schools for fourteen years. His teaching experience is an important ingredient in travel business. He is conversant with topics on Bhutanese Economy. 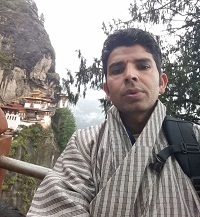 He also teaches Bhutanese Economy , Current Affairs and World Affairs to Cultural Tour Guides at BISHT, Taba and at Ugyen International Language and Cultural Institute. He has a good content on Gross National Happiness (GNH), a development Philosophy of Bhutan. Born January 1966, a period when Bhutan was going through drastic development change from modern roads, education, health care system to political developments in the country, today Bhutan is considered a place must visit and any visit would be fulfilling only when you have the company of a persons who has been through all phase of these developments. 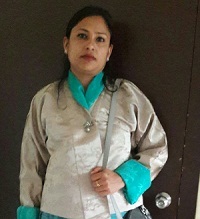 Educated within the country, quite linguistic Dzongkha, Sherchop, Lhotsham (Nepali-mother tongue), fluent English and indeed Hindi comes by default due to our proximity, trade and other synonyms. Padam Bdr Chuwan, served the govt and various other development partner agency(s) as a civil engineer. Many significant accomplishments such as construction of the Traditional wooden cantilever bridge over Mo-chu, Punakha Dzong, construction of various educational and philanthropic institutions, assessment of trail, design of campsites to the remote but ultimate trekking destination “Merak-Sakteng” located in the north east of the country. Hiking and trekking has always been a part of my life and work perhaps because of the rural childhood and foundation. Nobody explores his surrounding more than me and therefore be it Thimphu, Paro or Punakha, I am being referred to as a dictionary for hikes around these valleys. Talking of trekking, I am a regular trekker myself whenever I have free time. Drukpath has been introduced to me by the same man who supervised the construction of the trail when Bhutan opened up for tourism in the 70s. Trekked to Jomolhari even in restricted winter months, Lingshi, Laya and Gasa altogether known as first half of the snow man trek. Haa to Dorokha following the traditional trail from Tegula, Dorithasa and Rangtse. My quest for adventure in the Himalayas finally turned to take me to the exotic and ultimate destinations like Everest base camp, Manaslu circuit and Annapurna circuit etc in Nepal. Semiretired now from the long associated professional service, it is an adventure once again to be associated with NEST Adventure and their Team of tourism experts from Kathmandu as their associate based in Thimphu at WOW-Bhutan Travels. We are a Tour Operator and Travel Agent of trusted, passionate travel enthusiasts who create journeys to inspiring destinations. Our trips are completely based around your interests and schedule—they are one of a kind experiences that are as unique as you have ever imagine. We can have you traveling to the beautiful places in Bhutan, which you are sure to cherish the memories for years. Our expertise, knowledge, and personal relationships allow us to design journeys that are rugged and adventurous, cultural and festivals. Whichever you prefer, you can be certain that your trip will be filled with exclusive opportunities that only we offer. Whether you know exactly where you want to go or need some inspiration, Wow Bhutan Travels is here to guide you, and to create a journey that will surpass your expectations. We have experience in the travel industry, and we are constantly exploring the globe in order to provide you with best suited destination knowledge and well-planned itineraries that come complete with expert guides, and the perfect place to relax at the end of the day. Your visit to Bhutan will completely make you feel wow, as you come close to the nature. Bhutan is known to the outside world as the land of Gross National Happiness (GNH). In short, GNH is development with values. 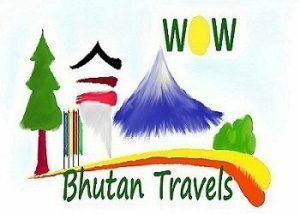 Wow Bhutan Travels is not only committed to providing you with an unforgettable and inspiring trip, we’re also committed to ensuring your happiness and comfort throughout. From the moment you browse our website to after you return home, Wow Bhutan Travels ensures that your journey is seamless, authentic, and beyond what you had imagined.